To-Do List, or... What Some People Will Go Through Just to Act Like a Couple of Lazy Bums. Or... Who the heck was Reilly, Anyway? Standing and running rigging—replace all, including sheaves where worn; convert boat to cutter rig with removable forestay, new mast tangs and running backstays. Make sure all sheet/halyard leads are fair; re-rig roller furling with new blocks. Rig reefing gear and boom vangs for maximum strength and ease of use. Internalize jib halyard, add 2 extra external halyards as spares. Install strongtrack, storm trysail track, spinnaker pole track extension. 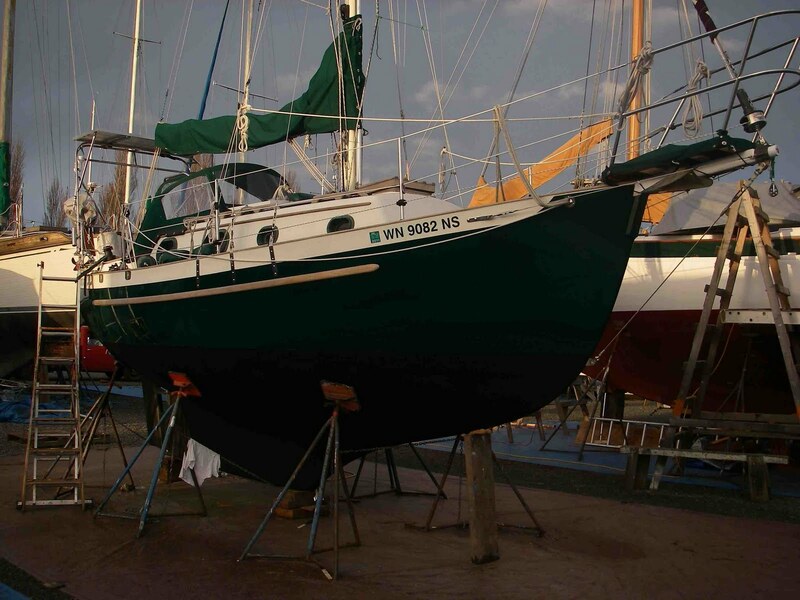 Rig boat for extensive downwind sailing and prevention of sail & line chafe. Have sails (made in 2005) inspected/repaired as needed--mainsail, genoa, staysail, cruising spinnaker, storm trysail, storm staysail.) All made by Carol Hasse’s Port Townsend Sails. One more needed, a light air drifter. Replace 23 year-old stainless chainplates with custom bronze ones. Tune rig. Replace old uncomfortable bosun’s chair. Life raft—have it inspected and repacked. Organize ditch bags. Ground tackle—overhaul entire system. Get old fire hose for chafe gear. Replace lifelines. Get new EPIRB. Rebuild bilge pumps & buy spare parts. Waterproof seals & positive locks for cockpit lockers. Have at least three independent handheld GPS. Have sextant, tables and know how to use them. Install Cape Horn wind vane self-steering gear. Replace old aluminum fuel tank. Install lee cloths on bunks. Secure boat for knockdowns; stove, bookshelves, floorboards, galley, etc. Emergency water supplies: handheld watermaker and spare gallon jugs. Install 175-watt solar panel on stainless arch. Install 110-volt inverter and electrical monitoring system. Re-wire boat. Convert all lighting to LED. Install new Single Sideband/Ham radio, get Ham licenses. Buy and install AIS/VHF radio. New stereo with iPod dock. Record all CDs onto iPod. Get tillerpilot in good working order. Engine survey & oil analysis. Kindles, iPads and ship’s library: get ebooks. 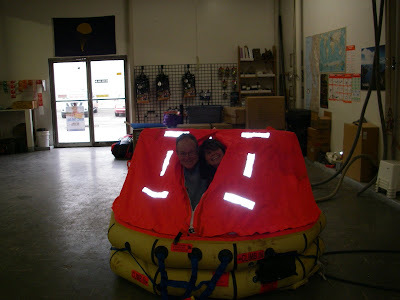 Replace rigid dinghy, which is too large to carry on deck, with inflatable dinghy & 2-hp outboard. New spray dodger, mainsail cover. Build wooden drawers inside hanging locker; create chart stowage space on sides. Give internal teak a coat of beeswax finish. Get ship’s papers in order. Passports, drivers licenses up to date. Learn French. Brush up on Spanish. We're still figuring out how to make the comments section easier for readers to do, but just discovered that an automatically-generated album of all the blog photos exists on Picasa, here.